A recent run of comments from establishment giants suggests that left-leaning ideas, held down for so long, may finally be in the ascendant again. In April, Deputy Prime Minister Tharman Shanmugaratnam raised more than a few eyebrows when he said the Cabinet, which was "centrist" when he entered politics in 2001, had crept leftward in recent years. "You still get diversity of views in Cabinet but the centre of gravity is left of centre," he said. Until last week, one may have read this as a generational shift. Hard-headed People's Action Party (PAP) leaders, a version of the theory goes, who had their hands on the steering wheel during the 1980s and 1990s saw first-hand how wildly successful Singapore was when free markets were allowed to work their magic. After 2000, however, some of them began to make way for younger leaders like Mr Tharman, and a greater mix of political ideas entered the party - hence that growing desire to moderate the excesses of economic conservatism. This theory died a fairly thorough death last week when a foremost member of that so-called hard-headed generation - Emeritus Senior Minister Goh Chok Tong - made a big speech on elitism that would have set the hearts of many social democrats racing. 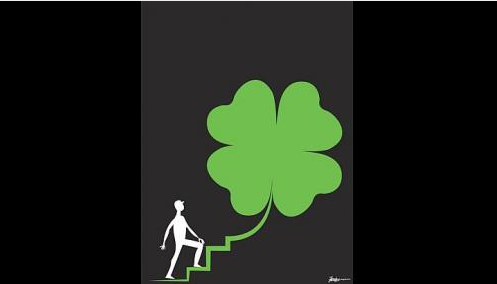 Speaking at his alma mater, Raffles Institution, a symbol of academic accomplishment in Singapore, he became the first PAP leader in a very long time to argue that success was dependent on that four-letter word: luck. To be sure, he was quoting America's Federal Reserve chief Ben Bernanke, who told students at Princeton University - a symbol of academic accomplishment in the United States - that meritocracy simply meant the "luckiest" people reaped the largest rewards. The luckiest, that is, in terms of family support and encouragement, and "in so many other ways too difficult to enumerate", Mr Bernanke said. But Mr Goh was clearly quoting in order to agree with the general thrust of the assessment. This linking of luck and success is not insignificant. Mr Goh does recount a story from 1980 of former prime minister Lee Kuan Yew arguing privately with economic adviser to Singapore Albert Winsemius and former president Devan Nair that for the state to seize all of an individual's wealth upon death was ideal on a philosophical level. But such radical ideas have not generally been aired in public. Instead, the PAP narrative used for years to shore up its meritocratic argument has insisted that success is primarily, if not entirely, dependent on hard work, skill and education. And since no segment of society had a monopoly on these commodities, those who ended up at the top must have done so fairly. By throwing luck into the equation, Mr Goh's speech at least asks questions about the original premise on what brings success to individuals - therefore casting doubt too on the logical deductions building up from that premise. Alas, left-leaning Singaporeans must not get all excited yet. Notable as this latest speech is, it must be pointed out that what Mr Goh meant by luck is very different from what others may mean. Mr Goh is referring to the luck of birth. If you happen to enter the world in a prosperous family, you are far more likely to be disproportionately well- equipped to succeed. Think Eton House, speech and drama classes, overseas exposure from young, tuition teachers, and so on. But when you do succeed later in life, it is still due to hard work, skill and education. You just had a bigger endowment of skill and education to start you off. Many social democrats, however, would argue that even success later in life is very much luck-dependent. For many people are hardworking, skilled and well-educated, but few among them can hope to become rich and successful. The best pianist or novelist or actor in the world is not that much better in playing, writing or acting than his peers in the top tier, but makes much more money. Even in academic citations, where luck might not appear important, one theory posits that one's work may be widely cited because of where it appears in the bibliography of academic papers. And beyond a certain critical mass of citations, people cite you more or less automatically, without having read what you wrote. Luck is what makes all the difference, the left-leaning aver. The prescribed solutions by the two views of luck are also quite different, as can be expected. Mr Goh's view requires the state to intervene more aggressively in the early stages to erase some of the disadvantages from the lack of luck at birth. The latter view, however, requires nothing less than significant redistribution. Since you didn't really deserve all that money you made - you just happened to be at the right place at the right time - you are obliged to return a large portion of it to society. And so, even though the signs do suggest that the PAP has moved to the left, as Mr Tharman has observed, and this move does not appear to be restricted to any particular generation of PAP leaders, there will still be some on the left dissatisfied with the magnitude of the shift. The dissatisfied, however, may be hoping for too much. The gains made by their ideological camp in recent years are already very considerable. And even with scepticism of capitalism peaking worldwide, the reality is that a small economy wholly dependent on global trade and open borders has limited scope for implementing the kind of social democratic programme they ultimately want.